I like a clever name and I think Reissued is up there. One of the discoveries I made at Magnolia Square, Reissued takes retro furniture pieces and rediscovers their beauty 'reissuing' them with new skins. The very clever Jacqui Porter uses Australian sourced fabrics that are enviro friendly (either sustainable new or vintage) which makes these one off pieces even more covetable. 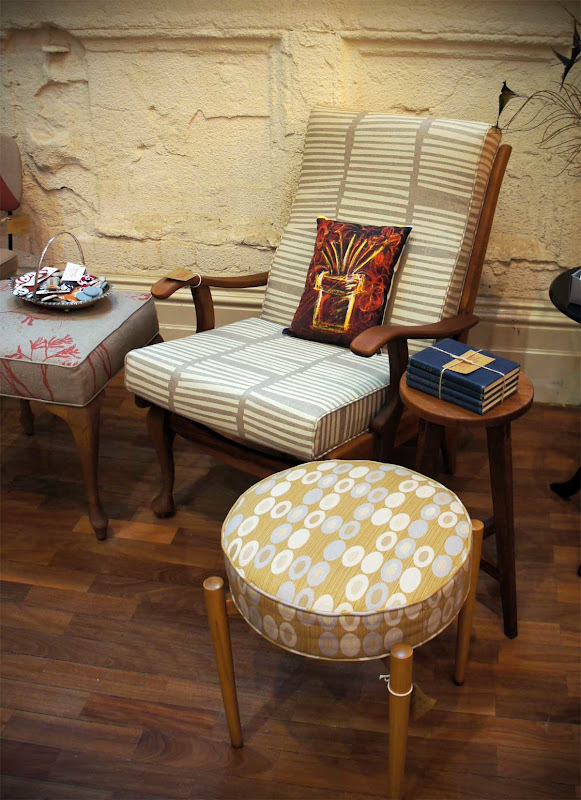 The retro furniture is also mostly Australian made and found locally. I have to say I really love furniture that has a past, I have been known to collect furniture from odd places - in particular I once 'found' a large high-back arm chair that had been sitting in the rain for I don't know how long. I had noticed it when on my way into college via the train and when it was still there by the railway tracks after many days my flat mate and I [Hi Kylie] took a car that was way too small and put this ridiculously wet chair in the boot, tied it down and drove very slowly home through the back streets so as not to be pulled over for dangerous driving! Once home I think it sat in front of the wall heater stinking out our flat for about a week before it had dried out. It now belongs to my Mum after it had been given a gorgeous magenta slip cover, she loves it! However I think if I did the same now my husband would disown me, Im reduced to collecting small odds and ends from opp shops - and I think he just 'tolerates' that - my man is one of distinctly modern (aka new) tastes! So suffice to say Reissued caught my attention straight away. 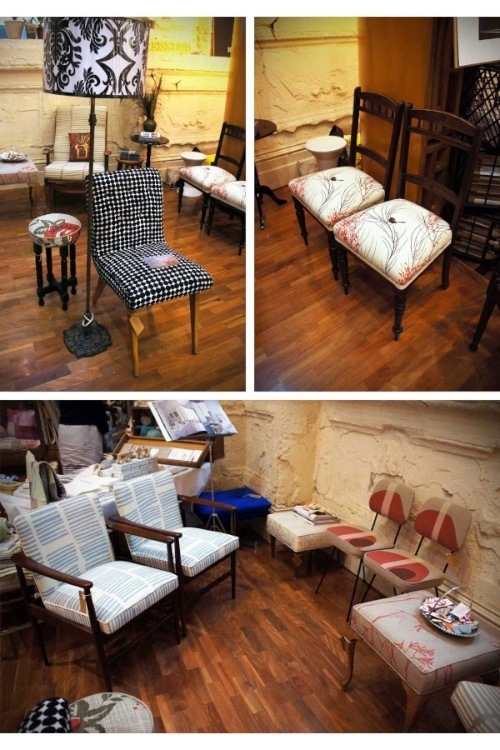 I was particularly taken with the pair of dining chairs [below top right] sporting the gorgeous Formosa hand printed fabric [watch this space for a post soon on Formosa - truly gorgeous stuff]. Im now thinking of a way to incorporate one of these lovely pieces into my latest design project, Ill let you know if I manage it! Reissued can be found at Maker Handmade or check out Reissued on Flickr.